Phosphate Remover Plus is the product to use to to treat very high levels of phosphates in water and or large bodies of water. One Quart/Liter (32 fl.oz) of our Phosphate Remover+Plus removes 6000 ppb orthophates per 10,000 gallon water. But we still notice that some company claims their product can remove 9000 ppb per 10,000 gallons with the same concentration. 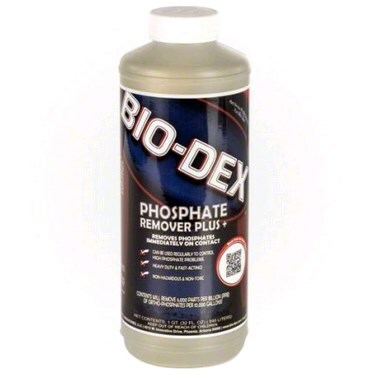 It removes phosphates immediately which will prevent problems associated with high phosphates such as discolored water. Phosphate Remover Plus works with all sanitizing systems, water chemistry and filter media. It won’t adversely affect the chlorine levels in your pool. Swimmers can go into the water right after you use the product. Phosphate Remover Plus will help you maintain a phosphate-free pool throughout the year, which is one less thing to worry about when it comes to pool maintenance. You can feel confident using Phosphate Remover Plus because it is non-toxic and non-hazardous so it won’t adversely affect swimmers. Phosphate Remover Plus helps manage the problems associated with high phosphate levels in large bodies of water and help prevent the problems associated with high phosphate levels. Once treated, phosphates are eliminated and will not revert back. Is not a flocculant but works with filtration. PHOSPHATE REMOVER +PLUS For best results: Treat existing algae with an algaecide and sanitizer first. Application: Apply the product around the perimeter of the pool while the filter is running. Following dosage on the label. Do not backwash or clean during this period. Add one and half ounces of Clearex 500 per 10,000 gallons of water to help keep water clear during treatment. ( Applying smaller amounts of Phosphate Remover Plus over a period of days will help reduce clouding). Apply a maintenance dose weekly or monthly. Test your pool water regularly and keep the water balanced.